I always blog about my victories, but people never get to see my losses. Maybe I like it more that way, but I don’t want to mask the sad truth; I lose games sometimes. Luckily, I get to pick which games you see, so this will be my example. You’ll notice the positive KDA and highest creep score in the game, but if you would have been in that game with me you would have believed that we could win. That’s what I believed as I was playing. I knew we could win this game. 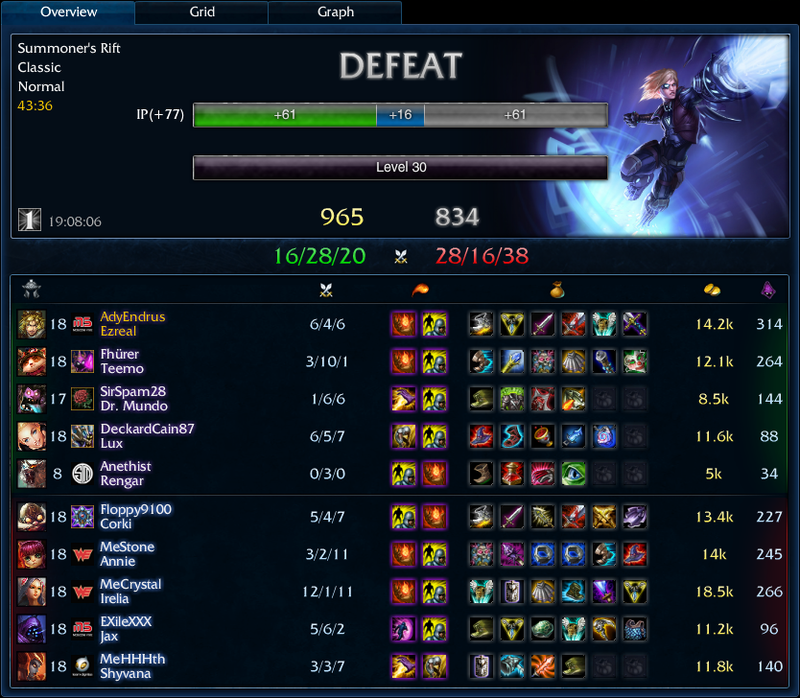 All we had to do was somehow DDOS Irelia. This game started better than it finished. We probably shouldn’t have dragged it out this long. Our bot lane was insanely strong with Ezreal/Lux. Very skill-shot dependent, but high range and damage. Lux and I shared kills, but she let me farm the creeps. She was an exceptional Lux. Despite a mental misstep of my own causing me to lose my Flash early we still were able to zone bottom away from creeps. My 5-0-5 start combined with Lux’s similar start are not shown in this game. Some team mates are too heavy to carry. Losing out on five early kills to my support and jungler didn’t help me this game, especially when our top fed three kills and then rage quit. I don’t know if he was ashamed or just bad, but if you’re going to take a solo lane and lose it you may as well stick around to help your team as best you can. If you can’t survive top then gank mid, steal jungle, or gank bottom and take Dragon. Your other option is to not feed three kills to top in the first five minutes of the game. We stayed in this game, and had surprising success. Our game plan was to ignore Irelia. She was already fed. If she showed up, we ran. If we could team fight without her then we could win. She actually verbally attacked her Corki after the game, saying that he was non-existent, so it was a 4v4. He was still richer than anyone else on my team. I probably should not have gotten another BF, and I probably should’ve grabbed a Last Whisper, I just was hoping to get to Black Cleaver and sustain with it’s attack speed and armor reduction. This would have let me melt targets like Annie, Corki, and Jax. Unfortunately, they were able to pick off Teemo and push to end. In the final seconds of the match Irelia Q’d to get on Lux and Lux died instantly. It made me question why I don’t play Irelia every game; if she can two-shot a champion of equal level with two items that deal damage while not using a summoner spell or an ultimate. Ability Power champions focus the whole game and all of their precious money into items designed to make them deal damage, and Irelia can counter that with a Trinity Force and Wit’s End? Balance in all things. I hate you, Rengar.